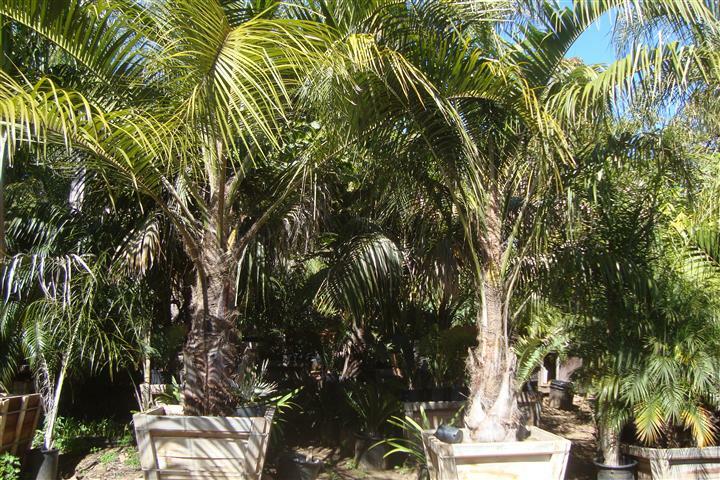 In this article I wish to introduce you to this cold hardy and desirable palm hybrid. It will be written so anyone can understand this information. The Mule Palm is a cross between the Pindo Palm, Butia capitata and the common Queen Palm, Syagrus romanzoffyana. Surprisingly, this hybrid single trunk palm looks nothing like either parent. And, most think it's far superior in appearance and overall appeal. It almost looks like a Coconut Palm. Read below for more information and viewing of photos. This popular inter-generic hybrid palm was probably first created by a man made cross of both parents about a hundred years ago. 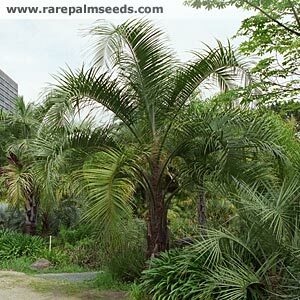 It has been given a trade name of "Butiagrus nabonnandii" but most people call it the Mule Palm. The latter name is utilized because it's been found on most specimens to have sterile fruit or no fruit at all. Any seeds formed almost always won't germinate to grow a new palm. Butia capitata is a monoecious species. This means that flower stocks have both male and female flowers. To produce Mule Palm plants, it takes a tremendous amount of work to viable and true seeds. On the seed producing Butia flowerstock, all the male flowers must be meticulously removed manually to prevent self-pollination by itself. Only after this can the Queen pollen but put onto the receptive Butia blossoms. This takes a lot of experience, effort and time. This is one of the reasons this hybrid is so rare and usually a bit pricey. 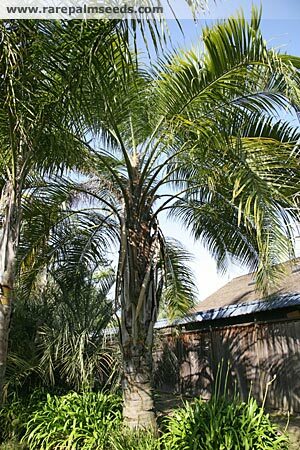 Mature height is up to thirty feet, much shorter than the Queen Palm. But, cold hardiness is better than a Queen as well. It'll take temperatures down to about 16 degrees F. This species prefers a bright sun location and can be grown in the desert in full sun. Below are the most important characteristics of this species. We almost always have an assortment of sizes for sale at our nursery. Just call us for present available sizes. As this is a hybrid, it doesn't belong to a genus. Rather, it is a hybrid between two different genera - an intergeneric hybrid. It's the intial cross, an F1 hybrid, that is referred to as a Mule Palm. Male pollen from a Queen Palm is usually manually placed on the receptive flower of a Pindo Palm. This may occur by insects or wind spontaneously. But, be aware that the opposite cross using the Pindo as the bearer of pollen given to a Queen does not give the same hybrid plant. It is an interesting cross but not as sought after as the reverse, the Mule Palm. So, be careful that you know the heritage of the plant you are getting..
Mule Palms are full sun palms, even in the desert. In fact, they languish and usually do poorly in the shade. 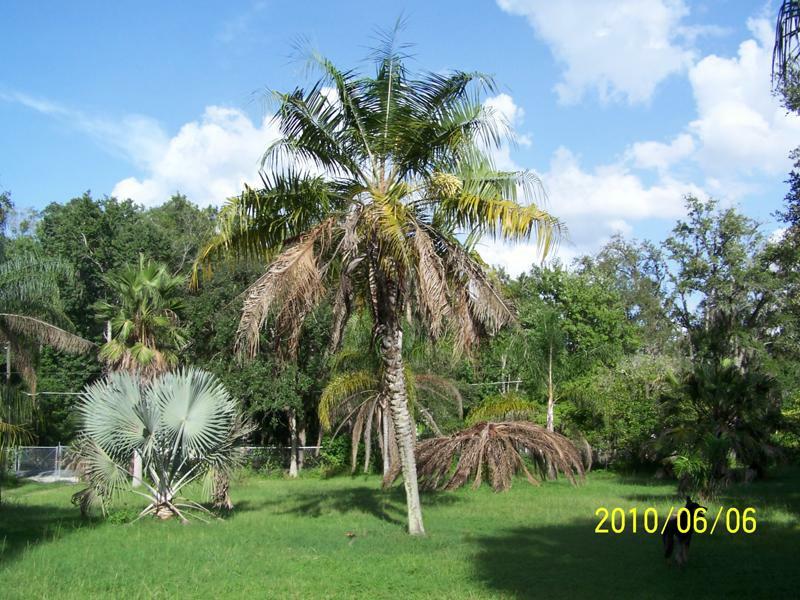 In our locality Mule Palms typically get to a mature height of twenty to thirty feet. But, it will take two to three decades to reach this height. The leaves a type of feather type leaf typically six to eight feet long. Leaf color in green. They do not take on any gray or silver from the Butia parentage. The trunk of the Mule Palm doesn't have a crown shaft. But, mature trunks are smooth. As a juvenile plant, the trunk will retain fibers for a while. This species is remarkably cold hardy and probably in the tops ten to fifteen palms as most cold hardy. Most consider this palm will go down to about 16 ro 17 degrees F. It's not as cold hardy as a regular Pindo, but not too far off. Most Mule Palms do not make seeds. If they do, they are probably not going to be fertile. Medium growth rate. Note slow at all. This species is not known to have a native habitat as it's a hybrid. This is not to say that you won't see spontaneously generated plants near Butia habitats in South America. 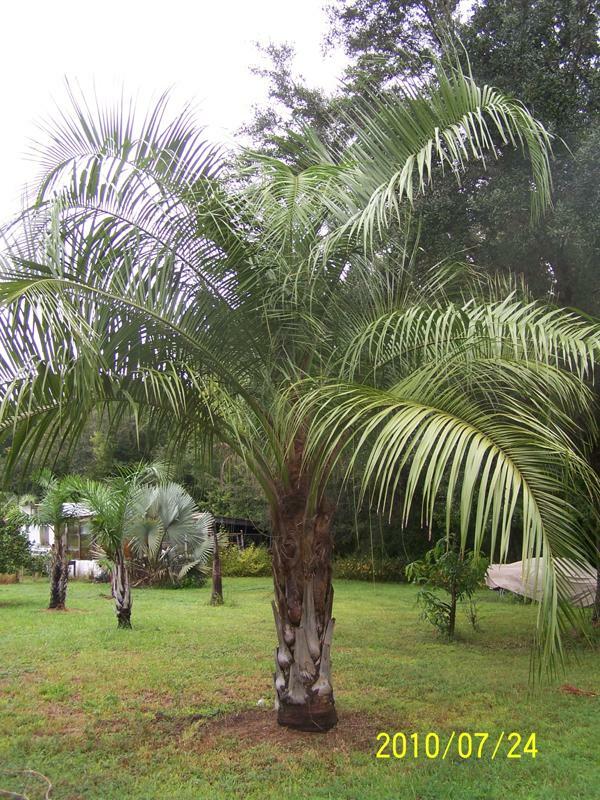 As mentioned above, the reverse hybrid results in a "funny looking Queen Palm". On occasion we do have these for sale as well. This species should be given room as the width of the crown can easily be over ten feet or more wide. Almost everyone grows them as a single specimen but some like to plant three together or form a small colony. Allowing ample "viewing room" is advisable. I am showing photos below of this hybrid (F1). 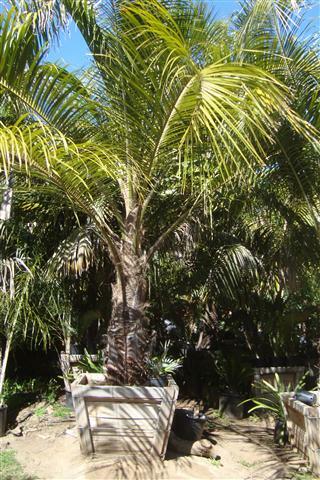 It is a large palm with a thicker trunk.